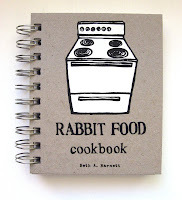 Rabbit Food Cookbook 5th Revised Edition Is Available! The Rabbit Food Cookbook new edition is published!! Gosh, that took a long time. Copies will be available to order online as soon as I get the etsy.com shop updated; any orders received before July 16 will be shipped out on the 16th!